The Semien (Red Fox) is a member of a dog family through not a dog. It has vibrant red colour with under marking and thick black and busy tail. Its ear is pointed. The Red Fox reaches to a height of 60cm at the shoulder. It feeds on grasses, Rats, Birds, Hares, and Hyrax. It can rarely be seen in the Semien mountain national park. 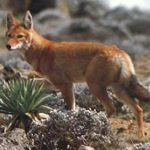 However, the Red Fox is abundantly found in Bale mountains national park. 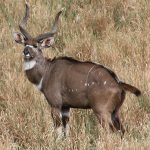 Another of Ethiopias many endemic species stately, the mountain Nyala has white marking on the legs and white spots on the face. The female are seen in parties of 10-15. However, males are commonly observed lonesome. An old male Nyala has dark gray colour while the female is redder. Females possess long necks and large ears but not horns like the males whose horns extend 88cm. A Nyala stands 135cm at the shoulder and weights 200-250kgs. And the weight of the bull reaches to 300kgs. 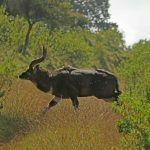 Nyala lie in shady places during the hottest time of the day. Therefore, the best time to watch Nyala is 5 in the afternoon. It is also seen in the morning and evening when it descends down the mountain for grazing. The Bale mountain national park alone hosts about 4,000-5,000 Nyalas. Some are seen in Arsi highlands. The Large fascinating mammals with the height of 75cms for the male. Their face is dark gray with wrinkles and long stiff hair. They live on the altitudes of more than 4500 meters. In the evening, they descend from the high steep cliffs to their caves where they rest on ledges usually handled together for warmth. In the cliff and scatted out in search of food. They feed on herbs, grasses and roots; hence they are herbivorous. 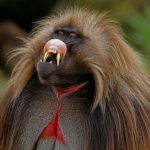 One can observe them roaming in large troops of up to 400, especially in the semien mountain national park. They are also found in Debre Libanos and Debre Sina areas along the main roads from Addis Ababa to the Blue Nile gorge and to Dessie town respectively. The long fa ced endemic mammal with high withers and slopping hindquarters. It is a social animal and is commonly seen in herds of up to thirty, under the leadership of master bull. Both sexes have double curved horns on their heads. It was discovered in 1891-92, south of the Golis range of Somalis land by brigadier general Swaynes. The area was considered as the home of Hartebeest, but now their numbers have dwindled greatly and are seriously endangered species due to rinderpest. The Nech Sar national park has been established for their protection. The family of Mountain Nyala, the Kudu, the Bango, etc. Over 40 races of Bushbucks are identified in the worl d so far; two of them Menelik and Powelli Bushbucks are found in Ethiopia. 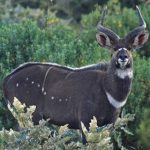 Menelik Bushbuck has white or black hairs than run down to the center of the bank while the female has white spot on the cheek and blackish collar on its lower neck. Bushbuck is widely spread on highland forests of up to 40 meters. It is easier to see the Buck in the Bale Mountains and Subba forest. High altitude with lower temperature is conducive for solitary Bucks. But Bucks are commonly seen in pairs in the Bale mountain national park. Bushbuck stands from 80-90cm at the shoulder and higher at the ramp. Horns, which characterized only the male, reach a length of up to 34.93cms. Bushbucks spend the day lying in the bush where there is no chance of hunting them. They have loud alarm call, which at times is made repeatedly. Belongs to the goat family. Its beautiful chocolate to chestnut brown coats shade to grayish brown round the muzzle, paler gray around the eyes, lower flanks, legs and rump, and pale gray or white in the belly and inside the legs. Both sexes have horns; the male possesses gigantic curved horns like arcs to the withers. It is over 110cms long unlike the female, which is shorter and thinner. It is a stronger built animal that has height of about a meter at the shoulder and weighing about 120kgs. Walia feeds on herbs and grasses, standing up on its hind legs like domestic Goats. It is common to see herds of Walia Ibex on the rocky ledges in the morning sun. 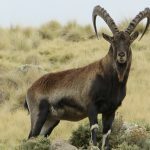 The only habitat for this splendid endemic mammal is the semien mountains national park.